Yes, I am cheating. I knew that by putting “pumpkin spice latte” in the title that you would all go a little crazy. Those three words have a way of making people weak in the knees and salivate like Pavlov’s dog. So one day I was looking at a picture of caramel apples and the next thing you know, my brain mashed these ideas together! Why not make a white chocolate caramel, add pumpkin pie spice and use it as a seasonal dip for apples? I couldn’t get to the supermarket fast enough to start testing. The white chocolate adds a dairy flavor to the caramel that subs in for the “latte”. These are stick-to-your-teeth good. For the Apples: Line a baking sheet with aluminum foil or parchment paper and lightly spray with nonstick spray. Insert sticks through stem end of apples, going about halfway into the fruit; set aside. Partially melt caramel and water in top of double boiler over simmering water or in microwave on low power, stirring often. Add 4 ounces of chopped white chocolate and ¼ teaspoon of pumpkin pie spice and continue to heat and stir until caramel, white chocolate and spices are combined, melted and smooth. While caramel is melting, prepare topping. For the Topping: Place gingersnap crumbs in a small bowl (large enough to fit an apple) and stir in the ¼ teaspoon pumpkin pie spice; set aside. Melt the 6 ounces of white chocolate in double boiler or microwave and set aside, keeping warm and fluid. Once caramel mixture is melted and smooth, hold a stick and submerge apple straight down into the caramel until caramel comes up as far as you would like it to go. You can cover the whole apple or leave a bit of skin showing, if you like. Remove the apple, letting any excess drip off back into the pot – be patient. Tilt pan, if necessary, to gain access to caramel. Turn apple upside down for about 1 minute (you are still holding the stick) to allow the caramel to begin to set. Immediately roll bottom and part of the sides of the apples in the gingersnap crumbs. Set on prepared pan and repeat with remaining apples, re-warming caramel if necessary. Scrape melted white chocolate into a parchment cone and snip a small opening from pointed end. 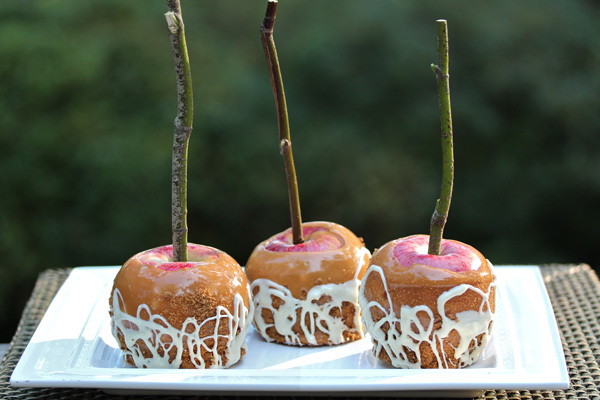 Pick up one apple at a time and pipe zigzags of white chocolate over cookies crumbs and caramel as seen in image. Place apple back on pan to set, repeat with remaining apples. Refrigerate if necessary to firm up chocolate. To store, wrap in clear cellophane bags and tie with ribbon, if desired. Refrigerate for up to 4 days. Bring to room temperature before serving. These are easiest to eat if they are sliced before serving.